From haunted houses to horrifying creatures, thousands of people visit Halloween Horror Nights at Universal Orlando Resort each year to endure all things scary. What most people may not know, however, is that Orlando is also home to a few local haunted houses that you can visit year-round. If you’re a looking to experience some frightening thrills this summer, make sure you check out the following places. Mortem Manor – Open year-round every Wednesday through Sunday, this attraction is known to be one of the best haunted houses in Florida. For $15, you can journey through the two-story manor and experience all of the terror behind the mansion walls. Afterward, feel what it’s like to be buried alive in the “Last Ride” burial simulator for an additional $5, plus tax. Mortem Manor is located at Old Town in Kissimmee. 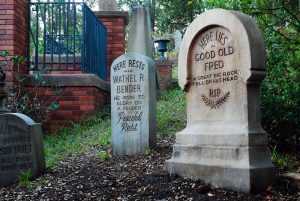 Haunted Mansion – For a family friendly spooky attraction, the Haunted Mansion at the Magic Kingdom Park is a perfect choice. Enjoy a tour of the eerie residence as you travel on a slow-moving doom-buggy through this classic attraction. With so many details to look at including stretching portraits, decorative gravestones and tombs, and an interactive piano and bookshelf, you’ll be entertained from beginning to end. After the ride, don’t forget to stop by Memento Mori to pick up some fun gifts. Zombie Outbreak – This isn’t a typical haunted house. Instead of ghosts, it has zombies. Zombie Outbreak is like an interactive version of Halloween Horror Nights – great for anyone wanting to experience an adrenaline rush. In this live-action zombie experience, you use real-life replicas of weapons to target and take out a military base full of walking dead. Ticket prices start around $25.00, and the attraction is located on International Drive. Next time you’re visiting Orlando, don’t miss out on all of the spooky fun. Whether it’s with your family or a group of friends, you’re sure to have a good time. To make experiencing all of the haunted attractions easier, stay at a hotel close to all of the action. The Rosen Inn International is just minutes away from world-famous entertainment, shopping, and is also close to all of the theme parks. For a hotel that offers comfort, security, and its own set of luxuries without a resort fee, book your stay by calling 407-996-1600.